The team hasn’t played a real game in 2018, meaning if things weren’t as agreeable and copacetic between head coach and his star quarterback as publicized, fans of the team should really be concerned. The idea is that you adopt a sympathetic view of motives, needs, desires of the subject at hand, whether it exists on a diet of hay and paddock treats or makes $125 million to throw a football. I’m not sure Jon Gruden would alter the tone of his whisper for anything, no matter if he’s tutoring a horse or Derek Carr. Difference being, the one who lives in a stall can’t verbally challenge Gruden, although the idea of Frank Caliendo impersonating Mr. Ed in a breakdown of game film with the head coach would be television gold. Especially if Caliendo played both roles. It will be fascinating to see what occurs if and when Carr bows his (fragile?) back and clashes with the man now in charge this season and beyond. The Raiders have yet to play a real game in 2018, meaning if things weren’t as agreeable and copacetic between Gruden and his star quarterback as publicized, fans would have reason for concern. If you’re not on the same page of the playbook in early September, there’s no chance of success when things spin off the rails later in the season. And they will, because it happens to all teams in some manner. Not everyone can be the Patriots, and even they have been labeled of late as not being entirely hunky-dory when it comes to how the organization’s leading characters view things. It’s when adversity hits that we might best discover how well the Gruden-Carr relationship will function long term, how much input and leeway to challenge certain decisions the fifth-year quarterback will have. It’s critical that this work, now and and in the future, for coach and player and franchise and any chance at the Raiders annually contending for a playoff berth. It’s good, then, that both men have something to prove. OK, so here’s the thing: He hasn’t worked with a lot of great ones. Gruden’s reputation as a quarterback whisperer was, more than anything, built in a TV studio and not on the field. He spent a major part of his time away from the sidelines the last decade instructing top prospects at the position on ESPN before the draft each year. He won a Super Bowl at Tampa Bay with Brad Johnson and coached Rich Gannon in the seasons prior to the quarterback winning an MVP award, but never has Gruden had a player at the most important spot with Carr’s talent, youth and upside. Gruden’s resume of quarterbacks under his direction includes a whole lot of Jeff Garcia and Chris Simms and Jeff George and Donald Hollis and Brian Griese and Wade Wilson and so on. Now, he has a three-time Pro Bowler in his prime. 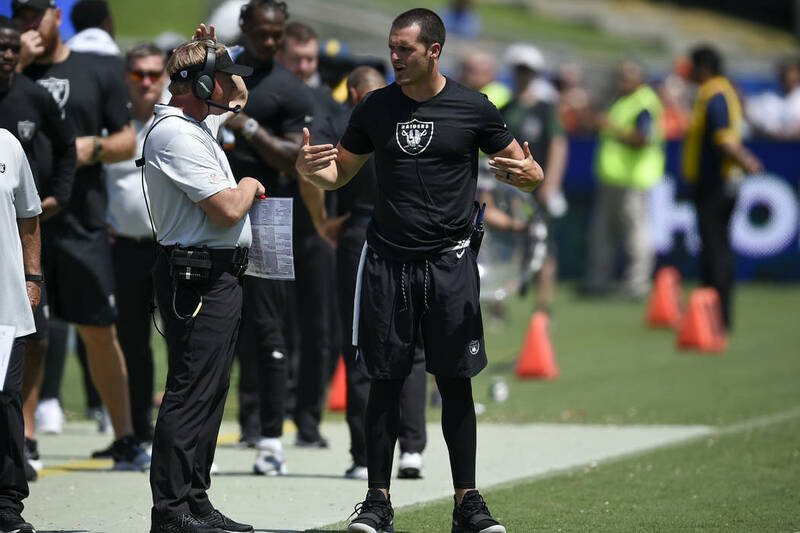 Carr has motivation to prove himself, given last year’s 6-10 record by the Raiders and his regression for a multitude of reasons, be it his injured back, offensive linemen getting hurt or a first-time play-caller in former offensive coordinator Todd Downing. Things just never fit. Carr believes they will now. “We want people to think, ‘Wow, these guys have been together for 10 years,’ ” Carr said of his relationship with Gruden. “In order to do that, the time you have to put in is a lot, it is. It’s a lot. And both of us work really hard on getting on the same page and thinking. I think we’re always going to continue to grow together and think about things differently and then figure it out — how do we want to do it? It has to work because neither is going anywhere, Gruden having signed a 10-year contract worth $100 million and Carr being extended five years before the 2017 season. It has to work because there aren’t two more important individuals with the Raiders when it comes to what occurs on the field. And if it can in the bad times, when adversity hits, in those moments things spin off the rails, the team will be much better for it now and when they arrive in Las Vegas. If it can work when the whispers reach an earsplitting level, the Raiders have a real chance.